Superabsorbent polymers (SAP's) are used to absorb and retain liquid in a variety of applications, including baby diapers and potting soil. One common SAP, known commercially as "instant snow", is sold as a white powder that can absorb several hundred times its weight in water. In so doing, it expands and hardens into a white fluff that looks and feels very similar to snow. This lesson gives a brief explanation of how SAP's work, and suggests a few classroom activities that use them. A polymer is set of identical molecules (called "monomers") connected in a long chain, typically thousands to millions of monomers long. In 1973, in an effort to improve water conservation in soil, Bill Doane and his colleagues at the U.S. Department of Agriculture developed the first superabsorbent polymer (SAP), known as "super slurper"1. It could absorb hundreds of times its weight in water, far surpassing previously known absorbents. The USDA passed the technology to several companies, who further developed the science. Today, super absorbent polymers can be found in disposable hygiene products (e.g. diapers), water retention products for soil, spill control materials, and grow-in-water toys. Fig. 1: Schematic of the chemical structure of sodium polyacrylate. Fig. 2: Artist's conception of a cross-linked polymer. The black line represents the polymer chain. The red bars represent locations where one element of the polymer chain is cross linked to another element. 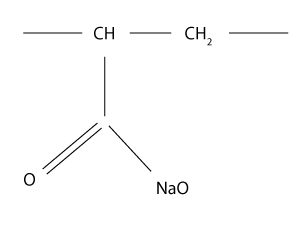 The most common SAP used in disposable diapers consists of a polymer of repeating monomers of sodium polyacrylate (C3H3NaO2 — see Figure 1), connected in a chain of thousands or perhaps millions of monomers long. 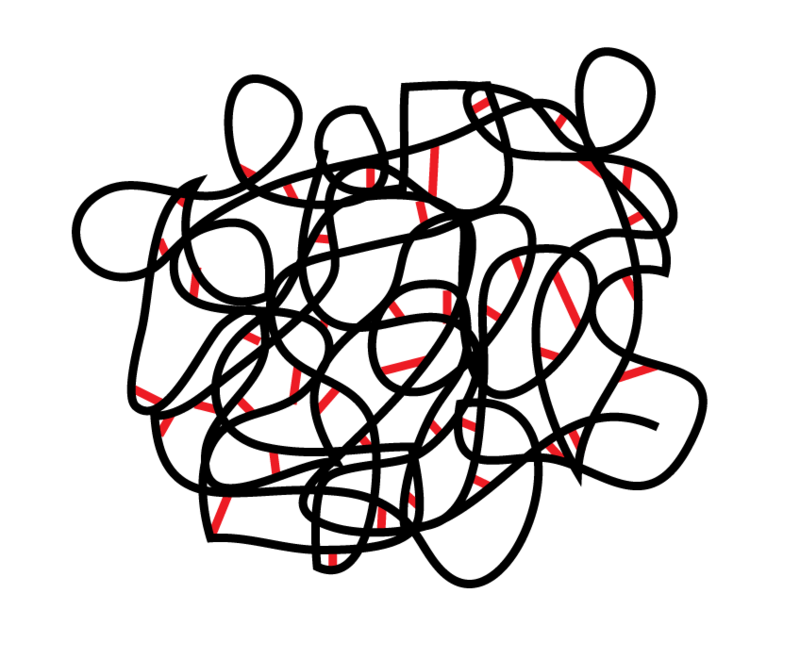 The chain is then cross linked by additional chemical bonds from one location in the chain to another until it resembles a very tangled and knotted ball of string (Figure 2). The material is generally sold in the form of a white powder. As it absorbs liquid, it turns to a gel, which makes it an effective immobilizing agent for baby by-products. Sodium polyacrylate has been demonstrated to absorb 800 times its own weight of distilled water. Unfortunately, the presence of salts or other impurities in the water decreases the absorption, making it slightly less effective in the field. Different polymers of sodium polyacrylate can be created by increasing or decreasing the density of cross links. In a certain range of cross-link density, the polymer changes behavior. Instead of turning into a gel as it absorbs water, it expands and hardens into a white fluff that resembles snow.2 This version of sodium polyacrylate is often marketed as "instant snow". In the presence of water, the sodium atoms will disconnect from the sodium polyacrylate polymer and disolve into the solution as sodium ions (Na+), leaving behind a negatively charged polymer chain. This process is similar to dissolving table salt (sodium chloride — NaCl) in water, which results in the sodium and chlorine separating into Na+ and Cl- ions in solution. At this point, the water inside the polymer cage contains many dissolved sodium ions, while the water outside remains relatively pure. Osmosis then drives more water molecules into the polymer cage in order to dilute the salty water inside. (In osmosis, when two different solutions are separated by a membrane, the solvent will tend to diffuse across the membrane in order to equalize the concentrations.) As the polymer soaks up more water molecules, it inflates and stiffens until it can expand no more, held in place by the many cross links. The density of cross links sets a limit on how much expansion can take place. For the polymer found in baby diapers, fewer cross links allow the polymer to absorb more water, creating a gel-like substance. In instant snow, more cross links reduce the amount of water that can be absorbed, but add support to the structure so that it becomes a stiff, fluffy material. Since osmosis is the driving force behind the absorption, the amount of water that can be absorbed depends on the purity of the water. If the water outside the polymer molecule has sodium ions in it, there will be slower and less absorption. Although sodium polyacrylate can absorb up to 800 times its weight in distilled water, it can only absorb about 30 times its weight in urine. Note: instant snow is also reusable. After sodium polyacrylate has absorbed water, it can be returned to its original powder form simply by leaving it out to dry for several days. The water will slowly evaporate. Heating it may accelerate the drying process but it may also alter the cross-linking of the polymer, and thereby change the performance of the material. Suppliers of instant snow recommend spreading it in a thin layer and leaving it in a dry place for 7 to 10 days. Oddly, no such recommendation comes with disposable baby diapers. The simplest classroom activity with instant snow is just to make a few gallons to play with. Instant snow can be purchased in bulk for about 5 cents a gram. A liter of snow takes about 20 grams of powder, so a few dollars of instant snow will keep a class entertained for quite a while. I like to tease younger students by telling them that I am using freeze-dried snow. Just add water to reconstitute it. You can also perform a magic trick with instant snow. Prepare a white styrofoam cup with a thin layer of instant snow powder or the powder from a (clean) disposable diaper, pour a cup of water into it, and turn it upside down over a teacher's head. The small amount of white powder is hard to see in the white cup (and you don't need to show it to the audience anyway), so the result comes as a big surprise. If you're using the powder from a diaper, it will turn into a hard gel that sticks to the cup so that nothing comes out. Make sure you practice first to get the right amount of water and use clean water. Be aware that absorption is significantly less for carbonated drinks, so adding cola is likely to produce a wet brown sludge. You can also color the snow by adding a few drops of food color to the water first. Once the water has been absorbed, sprinkle some salt on top of the snow or gel. Osmosis will drive the water back out of the polymer, producing a wet slurry. WARNINGS: Sodium polyacrylate is advertised as non-toxic, but it can be slightly irritating to eyes and nasal membranes, so it's best not to make snow angels in the stuff. Also don't pour it down the sink; it may clog the drain. 3. Size is presumably not relevant since water molecules and sodium ions are about the same size (roughly 100 picometers in radius).